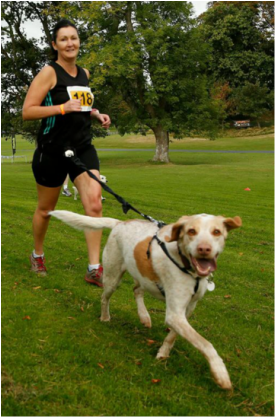 Based in Northern Ireland, Waggy Races is a cross country fun run where you compete as a team with your dog(s)! A dog. A harness (preferred) or collar. The sport of cross country running with dogs (canicross) originated in Eastern Europe as a means of keeping sled dogs fit outside of the snowy season! It has spread to some parts of Europe but has never reached N. Ireland.... until Waggy Races was born in 2014. Since the first Waggy Races at Castle Ward in March 2014, we have been asked by lots of people where it all came from, our background, our motives and lots of other questions. So for anyone who is vaguely curious, this is a candid account of Waggy Races from the beginning of time! The 1st ever start line at National Trust Castle Ward! Lets go back to the very start. Ruth and I would be sporty types - Ruth played hockey and has competed at a high level at athletics, primarily the 800m. Whilst I was unfortunate enough to inherit my Dad’s hips and I didn’t get any musical or dancing genes, I was always pretty athletic and coordinated, which led naturally to me playing rugby (I have since had to retire due to shoulder injuries). Ruth is from Enniskillen and I am from Lisburn and it is no surprise that we first met through sport – initially playing against each other at tag rugby during the summer (as the Pumas demolished the Rustlers 22-14) and subsequently at Mud Madness at Foymore Lodge. We had both grown up with dogs – my family had a big golden Labrador called Crust (named after the dog in the old film Mountain Family Robinson), while Ruth’s family had always owned Jack Russells. Shortly after we moved in together, we watched the tear jerker that is ‘Marley and Me’ on DVD and the scene of the puppy running along the beach led to us reminiscing and we decided to get a dog. But what breed? After months of research, we decided it had to be calm, easy to maintain, a good runner and must love hiking and the great outdoors. 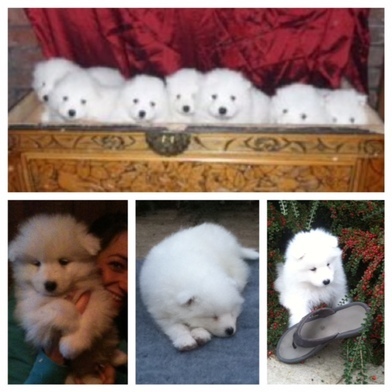 We opted for a Samoyed who met about one of the above criteria, but who is very cute! We picked her up from a farm near Armagh aged 7 weeks and named her Zola! Mum and dad at this stage were unknowingly about to start puppy day care as well (Zola gets dropped off like a child every day). Ruth and I both run casually with the City of Lisburn Athletics Club and while Zola was a puppy chewing her way through the house we chatted about how cool it would be to take her out running when she was older. These conversations grew to how much fun it would be to enter a race with your dog and compete against other dogs. However these were just conversations until one day in 2012 when Crufts was on TV and Ruth excitedly called me into the living room. In the Crufts arena were 100 owners attached to their dogs about to run a 3k race round a lake in a sport called ‘Canicross’! One of the runners incidentally was Ben Fogle (with his big golden Labrador) – adventurer, animal lover, all round nice guy and alleged look-a-likely for me according to my friends. Ben Fogle running round a lake with a lab led to an excitable chat and shortly after, we contacted the organisers in GB to enquire if they would ever hold an event over here. The answer was a resounding ‘no’ and after a bit of Googling, a few calls and a meeting with one of the competitors that Day (not Ben Fogle) we concluded that nothing like this had ever taken place in NI! Zola arrived in 2011 and sparked a few conversations about running. So that was the start of it, we had had the idea! We chatted about how a race could work in practice, potential venues, guessed some costs, looked at the uptake at GB events and we discussed several names. ‘Mutt Madness’ and ‘Runfur’ (fairly blatant copies some of NI’s lead running events) were mentioned before we decided on the fun sounding ‘Waggy Races’. We spoke to a lot of dog owners and runners about the idea, with responses ranging from getting odd looks, to high levels of enthusiasm! The event was loosely planned on paper and we contacted various venues, with generally positive responses. The Waggy Races concept however took a back seat shortly after. In June that year I decided to propose to Ruth while hiking through the Alps during the Tour du Mont Blanc. Subsequently our conversations were diverted from running with dogs to putting up tipis at Ruth’s family home in Enniskillen! In the wedding aftermath, the Waggy Races concept was reignited when we spotted pictures on Facebook of an event in England. It looked like such fun and enthusiasm came flooding back. We drew up a robust event plan, guesstimated a few unknowns and after a lot of heartache and headache we built a website that would allow people to enter online. A few days before Christmas in 2013, we published www.waggy-races.com, which had details of our first race - this would be a 5km trail race round the beautiful Castle Ward Estate in Co Down. We planned to announce this race at the start of January 2014 as the New Year fitness plans kicked in. However, a few days prior to the announcement I checked our email account and nearly jumped when I saw we had two entries! Kerry McGaughan (& Mack) and Sandra Kerr (& Max), will go down as our first two ever entries, a fantastic start as we hadn’t even publicised the race yet! A couple of days into the New Year we had our Super Sunday - 13 entries in the space of a couple of hours. 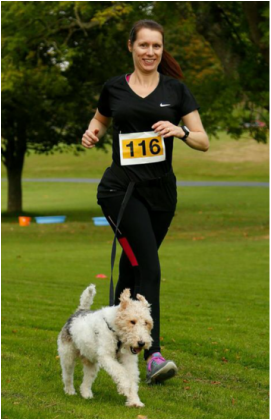 County Antrim Harrier and agility guru Louise Smart had caught wind of this Waggy Races malarkey and was our third entry – she spread the word far and wide amongst running and agility circles and suddenly we were approaching 20 entries. And so it began! The lead up to the first race was very exciting time for us as the entries came in, the course materials arrived at Waggy HQ, we acquired sponsors and the course signage was constructed. The flip side - it was also pretty anxious when entries dried up - the prospect of licking financial wounds (pun intended) and coming home from Castle Ward with tails between legs (pun intended again) was very real at times. Waggy Races could have been over before it began. 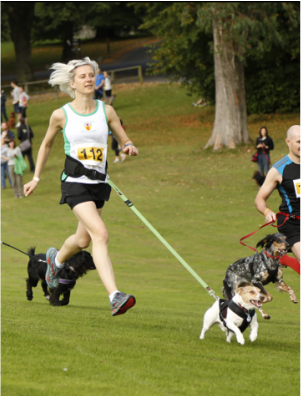 Thankfully, a push over the final 3 weeks would help us achieve a total of 89 teams for the first ever Waggy Races! The weather on race day (23rd March 2014) was beautiful - the clear blue sky and views over Strangford Lough definitely helped the event. The atmosphere was fantastic and we were delighted with how everything ran on the day. We had very flattering feedback from spectators, competitors and the venue. We also had enough numbers to convince us that it could work as a concept and above all else, we both really enjoyed staging the event. Following the Castle Ward ‘experiment’, Waggy Races was officially born. 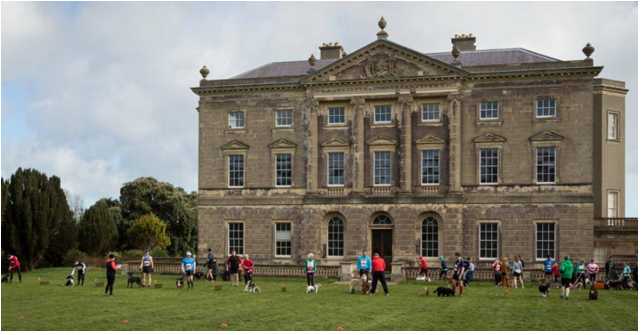 Contrary to some internet listings, we are not a charity but we have teamed up with Guide Dogs NI and also make donations to the National Trust, who have hosted us at some beautiful venues round NI. We have a number of sponsors now who come to our events and help us out with prizes, promotion and in generating a great atmosphere on race day...and we are indebted to them. We also have been reliant on the goodwill of friends and family for marshalling, first aid, setting up the course and a lot of other assistance. As we approach race IV at Portstewart Strand, we are both really enjoying the decision to have set it up. We now have a good core of returning competitors, as well as debutantes for each race. It is an archaic cliché but the huge amount of time we spend in the run up to each event really is offset by the people we have met and how much enjoyment we have reaped from it. 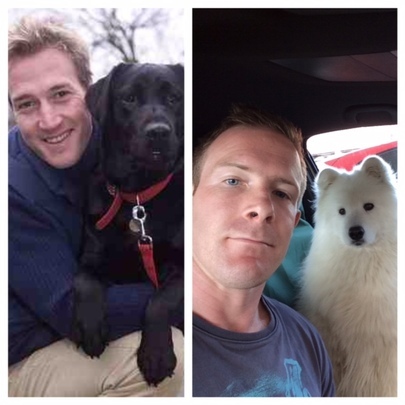 Above everything else, our most prized possession – our Samoyed Zola (now aged 3) is such an integral part of it!